Radio Australia’s Pacific Beat Program said in its feature of American Samoa’s dilemma due to restriction on fishing grounds for U.S. tuna boats, that the US fleet is facing a perfect storm: low fish prices, a hike in the minimum wage, and its boats locked out of the exclusive economic zones of Pacific nations because they reneged on a deal to buy fishing days from. Washington says the 2016 price of more than $11,000 a day is unaffordable. It is a big jump on the $5,000 a day paid by the US industry in 2014 and just $375 a day in 2013. Pacific Beat reports that under the South Pacific Tuna Treaty, the US Government supplements industry payments with $21 million in aid. The price hikes are steep, but they are in keeping with a longstanding Pacific Island goals of achieving a fair economic return on their fish. 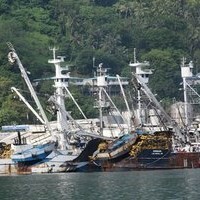 Other global fishing powers such as China, Japan and the European Union are paying similar fees. The US response has been to pull out of the South Pacific Tuna Treaty. Local businessman Herman Thomsen says a resolution of the situation is within Washington’s power. He believes the American government should do something. Asked what he would like to see from the US government, Thomsen said he would like to see Washington come to agreement with these Pacific nations. He said the US has helped a lot of these nations and he thinks it’s about time for them to ask for a favor, even if they have to pay, but make sure that the local canneries don’t close. The American Samoa Government received news of the US withdrawal from the Tuna Treaty not from Washington, but from Trimarine, one of the local canning companies. The American Samoa Government wants more consultation by the State Department and more of a role for American Samoa in Treaty negotiations. The governor’s executive assistant Iulogologo Joseph Pereira said part of the problem is that the territory of American Samoa cannot negotiate on its own. It has to go under the umbrella of the State Department and most of the time they are not sensitive enough to the unique circumstances that are faced by the islands. Pacific Beat says the local canneries, owned by Starkist and Trimarine, have only two months of tuna stocks in their feezers and have sought urgent concessions from the American Samoa Government. Iulogologo said the canneries are looking at some concessions on the cost of electricity and the cost of water and also looking to the government to advocate for the inclusion of Trimarine in the federal tax incentive scheme. Right now only Starkist is eligible to receive that benefit.